Providing support and help for over a century! In this day and age, at a time when our profession is witnessing significant changes, it is reassuring to know that some things haven’t changed for over 100 years. This February marked the incorporation of the Victorian Veterinary Benevolent Fund, later to become known as the Veterinary Benevolent Fund, and in 2015 change its name once more to become Vetlife. And although this year sees the centenary of the incorporation of our charity, it has actually been around for longer than that. We can trace our origin back to 1865 as the Veterinary Mutual Defence Society and if there are any historians reading this, they will know that this was only 21 years after the founding of the Royal College of Veterinary Surgeons in 1844. When the charity was founded, Queen Victoria was on the throne and The Viscount Palmerston was Prime Minister. Since then, this country has had 6 different monarchs and 29 different Prime Ministers. It’s gratifying to know that throughout that period of time, in essence that same charity has been providing support and help! It should be recognised that the current Vetlife is an amalgam, created over those many years, of other organisations, but it remains true to its original remit and vision, that of providing support to veterinarians, their families and dependents as well as to the wider veterinary community. The nature of that support has changed over time. In the early days, and as the word ‘benevolent’ suggests, the main role of the charity was to provide financial support, mainly to the widows and dependents of veterinarians. Today, although roughly half of the charity’s annual expenditure is still directed to the financial support of veterinarians in need of assistance and their dependents, the other half is channelled through Vetlife Health Support to those who are faced with issues associated with poor mental health. Along with other bodies that have been around for a significant length of time, there are other significant milestones, worthy of note. Two years ago, in 2017 we celebrated the 25th anniversary of the launching of Helpline. 2018 was Vetlife’s busiest year yet, with 2,775 contacts made to our Helpline, a 60% increase from 2017. From humble beginnings in 1992 this well received, and extremely valuable support service experienced its busiest year ever in 2018, responding to 2,775 contacts, 70% by email and 30% over the phone. Vetlife would not be in a position to provide the ever-increasing level of support that is required without the generosity of our supporters. By generosity, I mean in terms of financial help and time given by so many. I have already mentioned Helpline; there are 68 volunteers, not only veterinarians, but also other members of the veterinary community, who currently operate this 24:7:365 service. It is those individuals who helped those 2,775 contacts last year; and looking at the level of activity so far this year, the statistics for 2019 are likely to exceed those for 2018. There is no doubt in my mind that we will need more volunteers for Helpline by this time next year. Having said that, I am confident there will be enough individuals out there willing to put something back into their profession. Along with my fellow Trustees, I believe we have been successful in promoting Vetlife to members of our profession. The main challenge now is in ensuring that the funds are and will be in place, to meet those requests for help. Up until a few years ago, the charity’s financial projections indicated that income would remain ahead of expenditure. However, the Trustees now recognise that, on the near horizon, there is a potential shortfall in the necessary income levels required to meet the growing demand our services, and we are very much focused on closing that gap. So, how can you help? As has already been mentioned, Vetlife cannot survive without the support of our profession. Spread the word about the work of the charity; direct colleagues who you consider may need help to Helpline or our website; display Vetlife information in your workplace. We need financial support, to ensure that that potential gap we have seen on the horizon doesn’t become a reality! There are plenty of ways to get involved, such as becoming a member for as little as £4.20 a month, donating, organising a fundraiser, or choosing Vetlife as your charity of the year. We need more volunteers, both in Helpline and as Area Representatives. Contact us to learn more about what is involved in being a volunteer. Currently we really need more Area Representatives. Are you in a position to give up a small amount of your time to visit colleagues in your area who need support? Contact us to find out more by sending us an email with details of how you would like to help, along with your contact details. Send that email to info@vetlife.org.uk and we will get back to you. 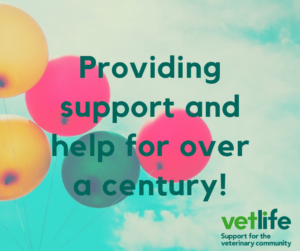 Much has changed in the last 100 years, and will no doubt continue to do so, but our aim is to ensure that Vetlife services will always be there for those that need them.